The semifinals are set for the USTA Winter Nationals, with another No. 1 seed falling in today's quarterfinals. Boys 12 top seed Nicholas Mangiapane lost to No. 7 seed Rudy Quan 6-0, 6-1, leaving just one boys top seed alive for the title: Noelle Ampong in the 14s. Three of the four girls No. 1 seeds have advanced to the semifinals. The 16s and 18s semifinals in Lake Nona will be streamed, and the matches are much easier to follow than previously, with chair umpires and on-screen score updates being used beginning with today's matches. No. 16 seed Christian Alshon defeated No. 3 seed Kevin Zhu 6-4, 6-1 today in the boys 18s, and No. 4 seed Jared Pratt is now the highest seed remaining in the draw. 16s and 18s full draws here; 12s and 14s full draws here. A few articles I've run into this week while trying to catch up on all that I've missed while I've been in Florida are linked below. Orange Bowl 16s doubles champion Kylie Collins is featured in this article in the Savannah Morning News. Collins trains at the Smith-Stearns Academy in nearby Hilton Head and her sister McKenzie, a member of the Virginia Tech team, also is mentioned in the article. Seventeen-year-old Felix Auger-Aliassime of Canada will not be making his Australian Open qualifying debut after a knee injury during training recently, but he did have an opportunity to train with Roger Federer in Dubai during his off-season, and he spoke with CBC Sports about that experience, his current coaching team and what improvements he is hoping to make in the upcoming months. India loves tennis, and has several promising young men (20-year-old Sumit Nagal won a Challenger recently and has qualified for the ATP event this week in Pune) but with Sania Mirza a doubles specialist now, the door is open for a woman to succeed her as the face of Indian tennis. The Times of India profiles several of the top candidates, a couple of whom are still eligible for the ITF Junior Circuit. The challenges of being from Alaska and pursuing a tennis career are obvious, but 23-year-old Eddie Lewis, a graduate of Division II Eckerd college in St. Petersburg Florida, is giving the Pro Circuit a try, according to this article from the Anchorage Daily News. So far he has not won a qualifying match in his two attempts last month in Florida and Mexico, but his biography suggests that he will not let a few losses deter him. The round of 16 at the USTA Winter Nationals featured the exit of two more No. 1 seeds, with boys 18s top seed Carson Haskins and boys 16s top seed Maxwell McKennon joining girls 14s top seed Daria Smetannikov on the sidelines. Haskins lost to USC recruit Bradley Frye, seeded 12th, 6-3, 6-4, and McKennon was beaten by JJ Tracy, a 17 seed, 7-6(4), 6-2. The other five No. 1 seeds have advanced to the quarterfinals, with the matchups for Sunday below. The 16s and 18s quarterfinals begin at 10:00 a.m. and streaming is available here. The 12s and 14s quarterfinals begin at 11:30 a.m. (MST) at various sites around Tucson. The USTA also announced on its twitter feed that Tuesday's 18s finals will be broadcast on the Tennis Channel at 3:30 p.m.
LOS ANGELES (Dec. 30, 2017) – Former UCLA All-American Karue Sell is the top-seeded player in the qualifying singles draw for the fourth annual Southern California Pro Futures Tournament, a $25,000 USTA Pro Circuit event that begins today on the campus of USC. Sell, currently ranked No. 686 in the ATP World Tour rankings, is originally from Brazil and teaches tennis at First Break Academy out of the StubHub Center in Carson. 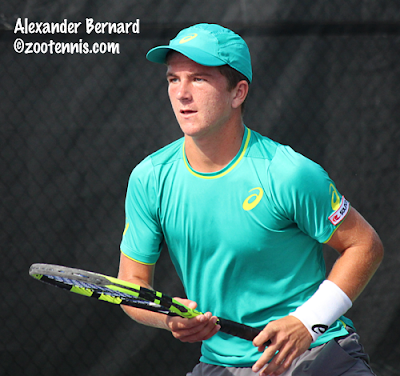 Other top-seeded American players include up-and-coming 18-year-old Patrick Kypson (No. 2), UCLA senior Martin Redlicki (No. 3), University of Virginia senior Colin Altamirano (No. 5), USTA-trained 18-year-old Sam Riffice (No. 7) and USC junior Logan Smith (No. 8). There are seven current USC players in the qualifying draw, and wild cards include local SoCal players Gage Brymer, formerly of UCLA, and current Bruin senior Austin Rapp. Friday, Jan. 5: Trojan Person of the Year, Jan. 5 from 3 to 5 p.m., Fred Williams, with the doubles final beginning at 4 p.m.
Saturday, Jan. 6: NJTL Tennis Cup: Closed event for all NJTL chapters with WTT format. Contact: Evan Smith at ESmith@scta.usta.com. Sunday, Jan. 7: USPTA PTR Coaches Clinic open to players, coaches and parents, 9 to 10:30 a.m. light breakfast. Speaker USC Men’s Coach Peter Smith. For more information on these events, email Siordia at siordia@usc.edu. My monthly Tennis Recruiting Network article on the top performances of the previous month is early this December, with basically no tournaments being played the last week of this year. Fourteen of the 17 players featured are the winners of the major Florida Junior tournaments; if you've been too busy with the holidays to follow junior tennis during the past five weeks, the article is a good way to catch up on the highlights quickly. I wish I could have included 18-year-old Andreea Rosca of Romania, who is scheduled to begin her collegiate career at TCU next month. She won two $15,000 ITF Women's Pro Circuit events in Egypt this month, but unfortunately, I don't have a photo of her. Somehow she never played a tournament I attended in her junior career. The first No. 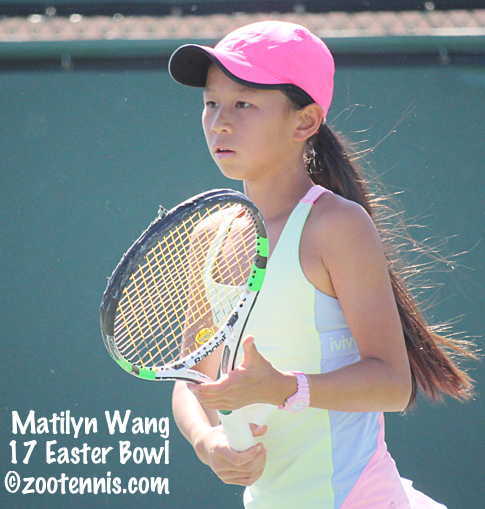 1 seed fell today at the USTA Winter Nationals, with Matilyn Wang, a No. 17 seed, beating girls 14s No. 1 Daria Smetannikov 7-5, 6-2 in Tucson Arizona. At the 16s and 18s in Lake Nona Florida, boys 18s No. 2 seed Bill Duo lost to Siem Woldeab, a No. 17 seed, and unseeded Kiana Rizzolo defeated girls 16s No. 2 seed Julia Andreach 2-6, 6-4, 7-6(5). With the singles round of 16 is tomorrow in all divisions, I probably won't continue listing how all the seeds fared after tonight, but I will try to post the quarterfinal matchups. The Tennis Recruiting Network has published their Winter National predictions; they did not see the girls 14s playing out the way it has either, but their other No. 1s are still alive. Jennifer Brady and Kristie Ahn will face off on Sunday in the final round of qualifying for the WTA tournament in Brisbane Australia, after both won second round matches Saturday. No. 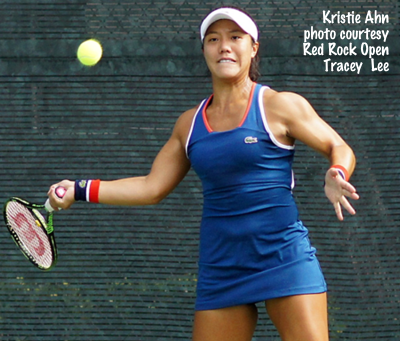 8 seed Ahn defeated Priscilla Hon of Australia 6-3, 6-4 and No. 2 seed Brady beat Irina Falconi 6-1, 6-2. The qualifying for the ATP event in Brisbane began tonight, with Ernesto Escobedo, Denis Kudla and Michael Mmoh the Americans in the draw. Former USC All-American Yannick Hanfmann of Germany is the No. 2 seed. Wild card announcements continue, with three WTA and three ATP events on the schedule for next week. Former LSU All-American Jade Lewis, who left Baton Rouge this May after one semester, has again received a wild card into the ASB Classic in her home country of New Zealand. In this article, published last week, the 19-year-old Lewis talks about her transition to the Pro Circuit and mentions how it differs from the atmosphere at most of the lower level pro tournaments she has been playing since. The qualifying for the ASB Classic has begun, with Jamie Loeb, Louisa Chirico, Asia Muhammad, Danielle Collins and Sachia Vickery the Americans competing for a place in the main draw. At the ATP event in Pune India, former Oklahoma State Cowboy Arjun Kadhe has been given a main draw wild card. 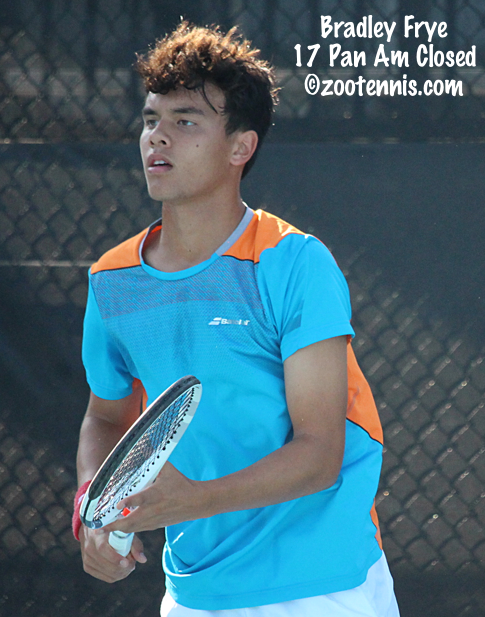 This article explores what Kadhe gained from his three plus years playing college tennis. Day two is complete at the USTA Winter Nationals, and as with Wednesday's first round, many top 16 seeds did not advance, although all No. 1 seeds have reached the first round. Two more No. 2 seeds were eliminated, with Max Fardanesh, the No. 2 seed in the boys 14s, losing to Will Mayew 7-6(3), 6-2 and Madeleine Jessup, the No. 2 seed in the girls 12s, falling to Emily Novikov 6-7(5), 6-3, 6-4. Girls 16s No. 3 seed Lauren Anzalotta lost to Perene Wang 6-4, 6-3, and Noah Schachter, who probably should have been seeded, beat boys 18s No. 7 seed Mason Meier 6-2, 6-1. 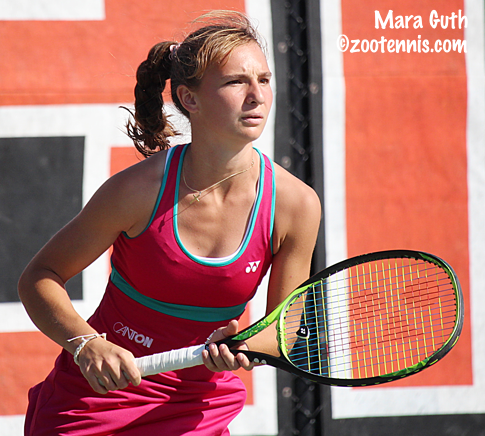 Fifteen-year-old Ava Hrastar defeated girls 18s No. 4 seed Sonia Tartakovsky 6-2, 6-4. Complete draws for the 12s and 14s in Tucson can be found at the TennisLink site. The 16s and 18s draws are here. Live streaming via Playsight is available for 16s and 18s in Lake Nona here. The WTA's 2018 season has begun tonight, with qualifying for the Brisbane tournament underway. Kristie Ahn is the first American winner of 2018, with the former Stanford star defeating Antonia Lottner of Germany 7-5, 6-1. Also in qualifying tonight are Americans Kayla Day, Julia Boserup, Jennifer Brady, Danielle Lao, Bernarda Pera and Irina Falconi and Caroline Dolehide, who play each other. The Coffee Bowl, the ITF Grade 1 tournament in Costa Rica, is nearly two weeks later next month than it was this past January, and that will present a problem for several players, as it is the same week as the ITF Grade 1 in Traralgon Australia. Most players don't play both even when Costa Rica is earlier in the schedule, but the top players in the boys draw, Juan Cerundolo and Thiago Tirante of Argentina and Drew Baird and Trey Hilderbrand of the US, are entered in both, and will have to make a decision which they will play by next Tuesday's withdrawal deadline. Nicole Mossmer, who has moved into the main draw at the Australian Open Junior Championships (as has Peyton Stearns), is also entered in both events. Stearns has withdrawn from Costa Rica, as has Dalayna Hewitt, who is just three spots out of the Australian Open main draw and is in the main draw in Traralgon. The No. 1 seeds all survived the first day of the USTA Winter Nationals in Lake Nona and Tucson, but many top 16 seeds fell in their opening matches Wednesday. G18s No. 2 seed Michelle Sorokko lost to Yekaterina Alferova 6-7(5), 6-1, 6-2 and B16s No. 3 seed Spencer Brachman was beaten by Luis Iriarte Bastidas 1-6, 7-6(6), 7-6(5). Welsh Hotard, the No. 2 seed in the B16s, was replaced at the bottom of the draw by alternate Braeden Ho. Although not all results have been posted, especially at the 12s and 14s in Arizona, I've noted in the lists below which top 16 seeds went out in the opening round today. Playsight streaming is available on many courts at Lake Nona, but with no chair umpires and no scoring devices visible, it can be difficult to follow a match. The WTA has published a lengthy feature in their Scouting Reports series about 2015 NCAA singles finalist Carol Zhao of Canada. Zhao, who left Stanford after her junior year to turn pro, discusses her difficult adjustment to the pro circuit, why she chose to attend Stanford, her goals for 2018, her musical talent and many other topics. The Canadian Press has chosen 18-year-old Denis Shapovalov as its Male Athlete of the Year for 2017. 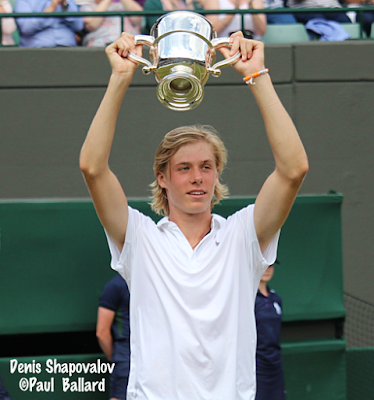 The 2016 Wimbledon boys champion has made huge strides on the ATP tour this year, going from around 250 to 50 in the rankings and earning wins over Rafael Nadal and Juan Martin Del Potro at the Rogers Cup this summer. Although Milos Raonic has won the award in past years, it's notable when tennis gets the better of hockey in Canada; Shapovalov got one more vote than Sidney Crosby of the Pittsburgh Penguins, who defended their Stanley Cup. Several more wild cards have been announced for the upcoming WTA tournaments prior to next month's Australian Open. American Sonya Kenin, who recently turned 19, has received a main draw wild card into the ASB Classic in New Zealand, according to this article on the tournament's website. Seventeen-year-old Destanee Aiava and Ajla Tomljanovic have received wild cards in to the Brisbane tournament, which begins December 31st. And 18-year-old Jaimee Fourlis, who has an Australian Open main draw wild card ahead of her for winning the Australian 18s Nationals, has received a wild card into the Hobart International. Tennis has been quiet the past few days, but tomorrow marks the beginning of the USTA Winter National Championships, one of five major USTA National events on the junior calendar. Prior to this year, the 16s and 18s Winter Nationals had been played in Scottsdale Arizona, but this year they have moved to the USTA's National Campus in Lake Nona Florida. Because there are not enough hard courts to host both genders and divisions, the girls will play on the Har-Tru courts this year, the boys on the hard courts, and that will be reversed next year. There should be live streaming via Playsight available for some of the 16s and 18s matches. The Winter National tournament page for the 16s and 18s also now has a system to track matches. The 12s and 14s continue to be held in Tucson Arizona, as they have been in the past. Below is the list of the Top 16 seeds in each age division. Chelsea Kung is the defending champion in the girls 18s, with 16s champion Angelica Blake seeded 16th this year in the 18s. Maxwell McKennon, last year's boys 14s champion, is the top seed in the boys 16s division this year. For a complete list of the results of the singles and doubles finals from 2016, click here. The TennisLink site, with draws, results and match times, is here for the 18s and 16s, and here for the 12s and 14s. 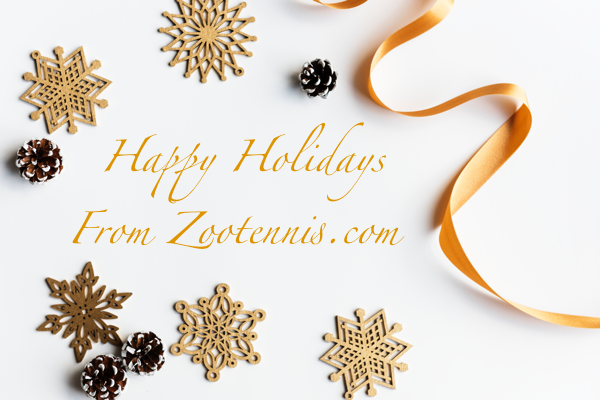 I will be taking time off the next couple of days for the Christmas holiday, but I'll be back on Tuesday with information on the USTA Winter Nationals, with the 12s and 14s in Tucson as usual, and the 16s and 18s at the USTA's Lake Nona National Campus for the first time. Both tournaments begin on Wednesday, December 27th. A couple of items I wanted to mention that I learned while I was in Florida: The Orange Bowl will be in Plantation Florida for at least another two years, with a contract signed with the city through 2019. The additional players from the US traveling to Europe for the Nike International and Les Petits As next month have been selected. The three girls that won their places on the team during the Les Petits As Playoff tournament back in November are Katrina Scott, Katja Wiersholm and Vivian Ovrootsky. The fourth place finisher, Robin Montgomery, has also been selected to the team. Coco Gauff, who made the semifinals at Les Petits As last year as a 12-year-old, was invited, but declined. She has entered the Australian Open Junior Championships, which are around the same time. The fourth boy selected for the team after Evan Wen, John Kim and Victor Lilov also came in fourth in the playoff: Jonah Braswell. 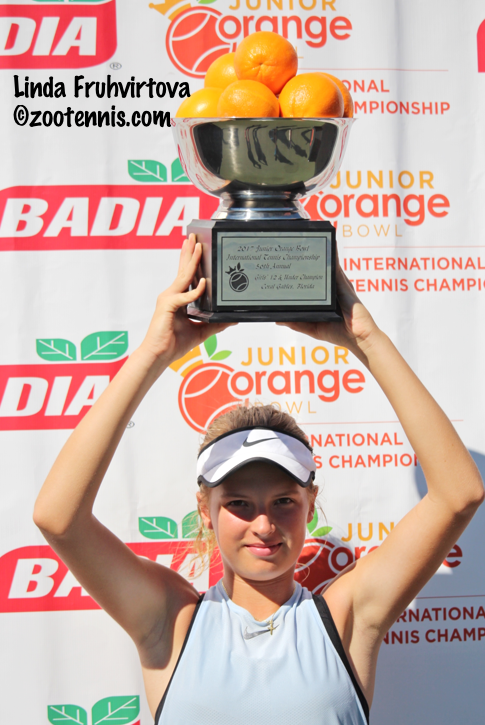 My recap of the Junior Orange Bowl is now available at the Tennis Recruiting Network. American Elvina Kalieva took the girls 14s title and Shintaro Mochizuki of Japan added the boys 14s title to his championship at the Eddie Herr. In the 12s, Linda Fruhvirtova of the Czech Republic won the girls title and Japan's Lennon Jones captured the boys title. I was surprised to discover that until this year, no player from Japan had won a Junior Orange Bowl title in the 56 years the tournament has been played. As I mentioned in Thursday's post, videos of all four finals are available through this link. In the December 4th issue of Sports Illustrated, Jon Wertheim published a lengthy article on the recent drug scandal involving the University of Georgia's men's team, which is now available online. When the news broke, back in May, that associate head coach Bo Hodge had been arrested, he was dismissed from his position. Alex Diaz, son of longtime coach Manny Diaz, was also arrested with the purchase and sale of the drug Adderall the reason for the charges. The Georgia mess serves as a jumping off spot for the major theme of the article: the prevalence of Adderall in college sports, and whether it serves as a performance enhancer for those who are not diagnosed with ADHD, but find ways to access the drug without a prescription. Anyone sending a child, athlete or not, off to college, should be aware of the possibility for abuse that accompanies this particular medication. I've had only a couple of days of off-season, but professional tennis has been quiet for a few weeks, so it's time to start anticipating the first events of 2018. The ATP's ASB Classic in New Zealand, which begins January 1st, has announced its wild cards, with former LSU star and French Open doubles champion Michael Venus of New Zealand getting a wild card into the singles draw, along with US Open boys champion Wu Yibing of China. Wu is referred to as the world's best junior, and he did get to the No. 1 spot after his title in New York, but Argentina's Axel Geller finished the year as the ITF World Junior Champion. Bobby Knight of College Tennis Today announced today that he and his family are moving to London, so he will be, understandably, providing less coverage of Division I college tennis. It would be hard to overstate what he has contributed to college tennis in the past several years, and just how important he has been to those of us who follow it will become apparent in the next few months. We all hope he will still be able to keep tabs on the major stories in college tennis, while recognizing that the in-depth coverage he provided is no longer feasible. Two years ago, Knight contributed a post to Zootennis.com called "How Do You Grow College Tennis" and it was one of the most popular posts on the website in 2015. His passion for the sport is evident in every suggestions, as is his knowledge of what makes college tennis such a special and under-appreciated facet of it. Thanks again Bobby, for all you've given college tennis. 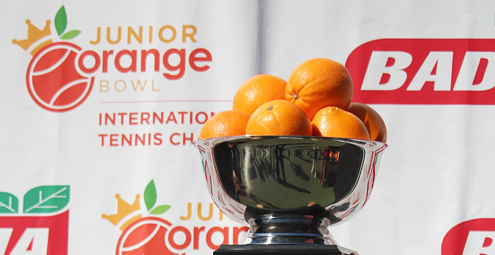 The Junior Orange Bowl announced this evening that all four of the finals Tuesday are now available for viewing online courtesy of Tennis Analytics. The dead time between points and changeovers are edited out, so an entire match can be viewed, even the three-hour-plus girls 12s and girls 14s finals, in less than 75 minutes. I still plan to post short videos of all the finals on YouTube, but that may take me weeks to process, what with Eddie Herr and Orange Bowl videos also in the queue. See this page for links to the videos. Speaking of professional videos, David Kozlowski was at the Eddie Herr covering all the finals, and he produced a 10-minute recap for his "Tennis with the Koz" show, embedded below. There are match highlights and player interviews, and I talked with Dave after the tournament about several players, with my comments featured throughout the show. 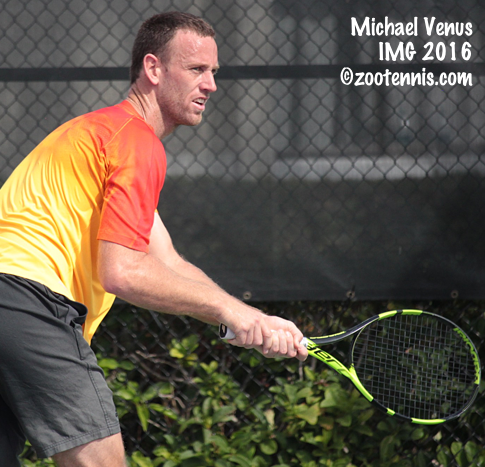 Earlier this month, while the Eddie Herr was going on in Bradenton, the Little Mo Internationals were held in Palm Beach Gardens Florida. Although I have never covered any of the Little Mo tournaments, I know they are an important step for very young players who are interested in exploring international competitive tennis, and many families form friendships there that last throughout the players' junior careers. 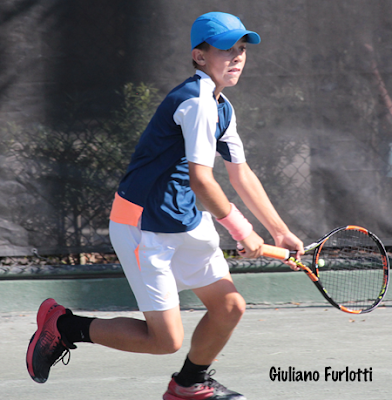 Two of the players at the just completed Junior Orange Bowl won the 12s titles in Palm Beach, with Valerija Kargina of Latvia and Giuliano Furlotti of Argentina, going on to make the round of 16 at the Junior Orange Bowl. Below is the release from the tournament and the list of winners. The Maureen Connolly Brinker Tennis Foundation (MCB) is proud to present the winners from the 11th Annual "Little Mo" Internationals in Palm Beach Gardens, Florida from December 1-6, 2017. MCB was so pleased to welcome 470 players from over 60 different countries to this "one of a kind" tournament for young tennis players held at the beautiful PGA National Resort & Spa. MCB would like to thank its proud sponsors: Tennis Competitors of Dallas (TCD), Palm Beach County Sports Commission, K-Swiss (Official Apparel and Footwear), Wilson Sporting Goods (Official Racquet and Ball), and My Game Solutions (Official Player Matching and Court Booking App). Maureen "Little Mo" Connolly was known for her outstanding sportsmanship on and off the court. To honor her legacy, MCB traditionally presents two Sportsmanship and two Kindness awards to two outstanding boys and girls at the "Little Mo". The "Little Mo" Sportsmanship Awards were given to Emilse Ruiz (Bella Vista, Argentina) and Mateo Pouso (Whitestone, New York). The Kindness Awards were presented to Elizabeth Patsula (Palm Coast, Florida) and Elliott Awomoyi (Cypress, Texas). The "Little Mo" tournaments are hosted by MCB in memory of its tennis champion namesake Maureen Connolly. Known by her nickname “Little Mo”, she was the first woman to win the Grand Slam in 1953 - winning all four major tournaments (Australian Open, French Open, Wimbledon, and U.S. Open) in the same year. She is still the only American woman and the youngest player at age 18 to have accomplished this magnificent feat. Only five players in the history of tennis have won the calendar Grand Slam. Unseeded Elvina Kalieva had both nerves and fatigue to contend with in the opening set of the Junior Orange Bowl girls 14s final Tuesday at the Neil Schiff Tennis Center on the campus of the University of Miami. But the unseeded 14-year-old didn't let those problems deter her, and three hours later she had claimed the title with a 2-6, 7-5, 6-2 win over fellow American Ellie Coleman, a No. 9 seed. Coleman, who didn't surrender a game in her semifinal match, showed no sign of nerves as the final began on a warm and sunny Tuesday morning. But Kalieva, who had played over three hours in her semifinal win over Mara Guth of Germany Monday, admitted she was caught off guard by Coleman's hot start. "She was playing really good, I wasn't expecting her to play like that," Kalieva said. "She was playing super aggressive." Kalieva said she felt some fatigue, but the adrenaline from being in the final overcame that, and she settled down in the second set, just as Coleman began to see her first serve percentage drop. Kalieva got an opportunity to serve for the second set at 5-3, but couldn't convert that game. She did get a set point with Coleman serving at 4-5, but Coleman saved it. Coleman was not able to convert either of her game points at 5-6, and an unforced error and a double fault gave Kalieva the 75-minute set, which could have drained Kalieva of her remaining energy, but did not. After two sets, Kalieva was clear on what strategy she needed to employ. "I was just trying to hit the ball deep to her backhand," said Kalieva. "Her forehand's really good, but her backhand's a little weaker, so I was trying to keep it cross court." The third set didn't start well for Kalieva, who lost her serve, but, as in the second set, she got the break right back, and saved three break points in her next service game for a 2-1 lead. Kalieva got her chance to take control in the sixth game, breaking Coleman for a 4-2 lead, and as Coleman's unforced errors piled up, Kalieva went in the opposite direction, playing aggressively, but with appropriate margins, and she held and broke, with Coleman double faulting on match point to end it. "In the first set I wasn't really engaged into the match," said Kalieva, who trains with Antonio Torri at ProWorld Tennis Academy in Delray Beach. "Ellie was just going for her shots. But [in the third set] I grabbed onto it at 3-2 and pulled it out." Coleman was content with her strategy, if not her execution. "I expected her to play her best, and just go with it," said Coleman, a 14-year-old from Michigan. "I think she played well and congrats to her on the tournament. I think I played the right tennis, played the way I need to play to improve, so I'll keep improving on that." 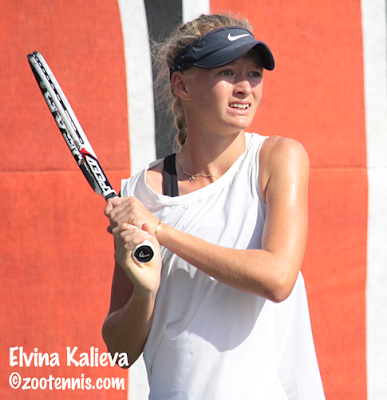 Kalieva called winning the Orange Bowl a dream come true, but now she will look to the next level of competition, playing International Tennis Federation tournaments and the 18s division in USTA events. Like Alexa Noel last year, Kalieva won the title without being seeded, but she said that situation didn't faze her. "I didn't really pay attention to that," said Kalieva, who beat six seeds in her seven matches. "I didn't really care and I wasn't really surprised, because I was playing 18s tournaments." The girls 12s final, played simultaneously on an adjacent court, was nearly as long as the girls 14s final, with top seed Linda Fruhvirtova of the Czech Republic defeating No. 3 seed Alexandra Eala of the Philippines 6-7(4), 6-3, 6-2. The 75-minute first set saw only two service holds, with Eala failing to convert her first set point at 6-5 when she double faulted. But Eala took advantage of errors by Fruhvirtova in the tiebreaker, claiming the set when Fruhvirtova's forehand return found the net. The second set went much more quickly, as Fruhvirtova found her range with her ground strokes, while Eala's game was not as solid as earlier in the match. In the third set, Fruhvirtova couldn't shake the gritty left-hander, but when Fruhvirtova broke Eala from 40-0 up to take a 4-2, lead, she didn't look back, holding and breaking for the title. "I was motivated, I really wanted to win," said Fruhvirtova, who had lost in the Eddie Herr 14s final earlier this month. "So I didn't give up. She played really good, but I tried my best, and I won. The final of the Eddie Herr was really close, so I wanted a lot to win this tournament." 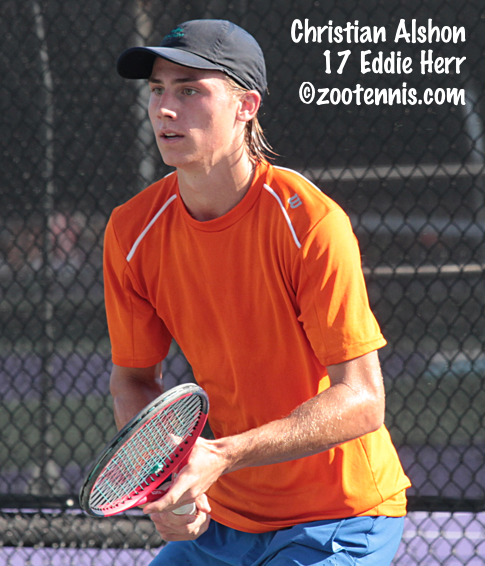 Unlike Fruhvirtova, Eddie Herr finalist Alex Bernard was not able to improve on his result at the Junior Orange Bowl. For the second time in three weeks, top seed Bernard fell to No. 2 seed Shintaro Mochizuki of Japan, with Mochizuki claiming a 6-3, 6-3 victory in the boys 14s final. Bernard took a 3-0 lead in the opening set, but Mochizuki used that deficit to change his tactics. "When I was down 0-3 in the first set, I thought if I don't do something I lose," said Mochizuki, who is the first Japanese boy to win the Boys 14s title, with Kei Nishikori the only other finalist from Japan back in 2003. "I changed my tennis." Mochizuki said he enjoys coming to the net to finish points, and that strategy was particularly effective against Bernard. "He really takes so much time away from me," said Bernard, a 14-year-old from Naples Florida. "He has a good game style to play against me. I am a little bit farther back and he just takes time away and makes me run all over the place." Bernard said he thought he played better than he had in the Eddie Herr final, but Mochizuki gave him few opportunities. "I just wasn't comfortable with my shots compared to some of the other matches," Bernard said. "When I was getting my chances, I wasn't feeling I could really attack that much. I was waiting for him to miss and that didn't work too well." Mochizuki didn't miss much, although Bernard was able to go up a break to take a 3-2 lead in the second set, only to give it right back. Serving a 3-4, Bernard had a game point, but he ended up losing a four-deuce game and Mochizuki held for his second major title of the month. "I'm very happy, because I won Eddie Herr, I want to win this tournament too," said Mochizuki, who trains at the IMG Academy in Bradenton. "It's a way to be a good player, and I want to be No. 1 in the world." When it rains, it pours, and Japan got another champion in the boys 12s division, with No. 7 seed Lennon Jones defeating No. 3 seed Nishesh Basavareddy of the United States 6-2, 6-3 at Salvadore Park. 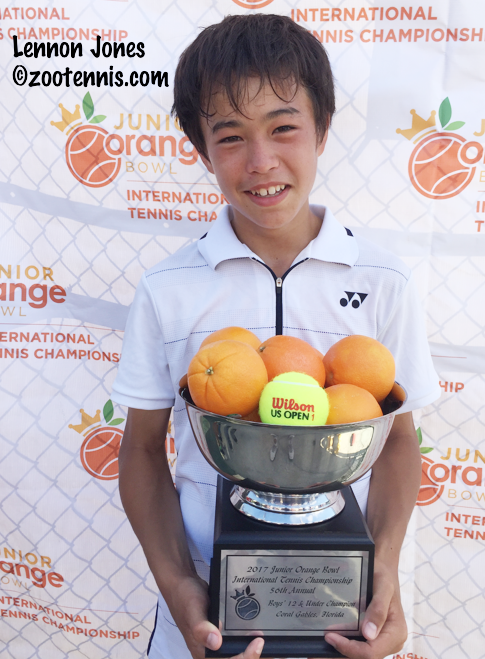 Jones, who was runner-up at the Eddie Herr earlier this month, was able to return to Japan with a winner's bowl of oranges. "My opponent played really good," said Jones, whose father is from California. "He didn't miss that much, and I tried to rally with him, and if I can, try to get a winner off him. I tried drop shots, high balls and stuff, mixing it up, so I think he got confused." Although disappointed with the outcome of the final, Basavareddy gave credit to Jones's level of play. "I feel really good about my performance this week," said the Carmel Indiana resident, who took out top seed Alexander Blockx of Belgium in the semifinals. "He played much better today. He was the more aggressive player today and I was on the defense more and he got more free points with his serve." "I always wanted to win the Junior Orange Bowl," Jones said. 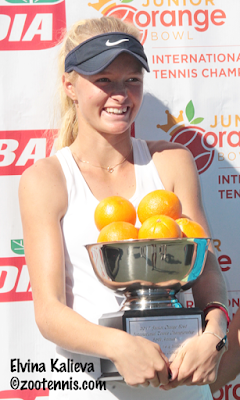 "This is my first time being at the Junior Orange Bowl, but I won, and I am very happy." Below are the results from the third place and consolation finals. Complete draws can be found at the TennisLink site. Alvaro Guillen Meza(ECU) def. Pedro Boscardin Dias(BRA) 7-5, 6-3. Note: Pierleoni lost in the first round of the main draw last Wednesday and won 10 matches in the next six days to claim fifth place. Only two of his wins were walkovers. The girls 14s Junior Orange Bowl final will be an all-American battle after No. 9 seed Ellie Coleman and unseeded Elvina Kalieva reached Tuesday's championship match in contrasting fashion. Top seed Alexander Bernard will face No. 2 seed Shintaro Mochizuki of Japan in the boys 14s final and No. 3 seed Nishesh Basavareddy will take on Japan's Lennon Jones for the boys 12s title after Basavareddy overcame top seed Alexander Blockx of Belgium in a three-hour battle at Salvadore Park. Coleman needed only an hour to defeat Dariya Radulova of Bulgaria, a No. 17 seed, 6-0, 6-0, with Coleman playing her aggressive game well and Radulova having difficulty staying in the points. "I knew a little bit about how she played and so I just went out there to execute what I could do to the best of my ability," said the 14-year-old from Midland Michigan. "That's what ending up working." Coleman, who was playing indoor tournaments in the Midwest before coming to Florida for the America's Cup at the USTA National Campus last week, said she has been concentrating more on her development than her results. "I try not to focus on the result at all," Coleman said. "I just try to focus on giving a perfect effort on every point, never giving up and doing everything in my ability to give my best." Coleman, who reached the finals of the USTA 14s Clay Courts last year, agreed that she will be playing in one of the biggest matches of her career on Tuesday. "I'll try to put that aside and try to focus on my side of the court," Coleman said. In contrast to Coleman, Kalieva needed over three hours to get by Mara Guth of Germany, a No. 9 seed. The 14-year-old, who is from New York but has been in Florida for the past four years, served for the match at 5-4 in the second and 5-3 in the third set, but managed to overcome her failure to convert either of those opportunities. "She was pretty tough and she was getting everything back," said Kalieva, who was up 3-0 and serving in the second set, but couldn't close it out in straight sets, with Guth breaking at 30-40 when Kalieva served for the match at 5-4. "I had to be more aggressive, but I pulled it out in the third set somehow." Kalieva was down an early break at 2-1, but got it back in the next game. She broke with a forehand winner on the line to go up 5-3, and took a 40-15 lead in that game, but Kalieva double faulted on her first match point and hit a nervous looping backhand way long on the second. After winning that game for 5-4, Guth was unable to keep the pressure on Kalieva, who stepped up her game to earn three more match points at 0-40. This time Kalieva was able to close, with Guth hitting a forehand wide to earn a 6-2, 6-7(3), 6-4 victory. Kalieva said she wasn't surprised she didn't receive a seed, having played 18s most of the year, but coming back down to the 14s for this tournament was a high priority. "It was always my dream to win Orange Bowl," said Kalieva, who reached the quarterfinals in the 12s two years ago. "So I thought I'd sign up for 14s and see how it goes." Kalieva and Coleman are good friends, but have not played except in practice. "She's pretty aggressive," said Kalieva. "So it should be fun." In the boys 14s final, Bernard is looking to reverse the result of the Eddie Herr championship match, which Mochizuki won 6-3, 6-2. "I'm going to try to make him play a lot, really work the points, wait for my opportunities and use them when I get them," said Bernard, who overcame a slow start against No. 7 seed Alvaro Guillen Meza of Ecuador to post a 7-6(4), 6-2 victory. "Last time, I had some chances right at the beginning, but didn't really take them, and he just took over a little bit." Against Guillen, Bernard fell behind 3-0, losing his first two service games, but recovered to take a 5-4 lead. Guillen saved two set points serving at 5-4 and one serving at 5-6, but managed to force the tiebreaker. It was high quality and entertaining to the scores of fans gathered around Court 1 of the Neil Schiff Tennis Center, with lobs, drop shots, volleys, as well impressive ground strokes, often on the same point. But a double fault put Guillen down 5-2, and after saving one more set point with a backhand pass, Guillen succumbed, with Bernard blasting a forehand winner to end the tiebreaker. The second set swung Bernard's way quickly and once he got a second break to go up 4-2, the fight went out of Guillen. "He plays pretty intense, so I think [the loss of the tiebreaker] took a little bit of the intensity away from him," said the 14-year-old left-hander, who is from Naples Florida. "It made it a little bit easier to win the points, there were shorter points, and he kind of went away a little bit." Mochizuki was on the ropes in the quarterfinals against Leo Borg Sunday, down 4-3 in the third with Borg serving, but in Monday's semifinal against unseeded Pedro Boscardin Dias of Brazil, Mochizuki was control in his 6-4, 6-3 victory. Bernard has seen for himself what Mochizuki's strengths are. "He's really good at taking the balls on the rise and he has good volleys," Bernard said. "He takes a lot of time away and is able to close at the net really well." Like the girls 14s semifinals, the girls 12s semifinals featured one quick match and one ultra-competitive one. Top seed Linda Fruhvirtova of the Czech Republic defeated No. 8 seed Clervie Ngounoue 6-1, 6-0, while No. 3 seed Alexandra Eala of the Philippines outlasted No. 2 seed Sofia Costoulas of Belgium 7-5, 7-6(3). Costoulas led 5-2 in the first set, only to see Eala storm back to win five straight games. In the deciding tiebreaker, Eala, a left-hander, was able to dictate with her forehand, closing it out on her second match point with a forehand winner. Eala lost in the Eddie Herr 12s semifinals to Fruhvirtova's younger sister Brenda, the eventual Eddie Herr champion, who could not play Junior Orange Bowl due to a change of rules denying entry to 10-year-olds. Linda lost in the Eddie Herr 14s final to Vivian Ovrootsky. 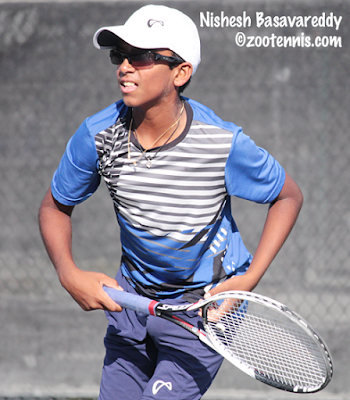 At the boys 12s at Salvadore Park, Basavareddy ousted top seed Blockx 6-4, 3-6, 6-4 to reach the final against No. 7 seed Jones. According to observers, the match was a classic, but Jones will have the advantage in Tuesday morning's final, as he needed much less energy to defeat unseeded Nahuel Nicolas Eli of Argentina 6-4, 6-2. 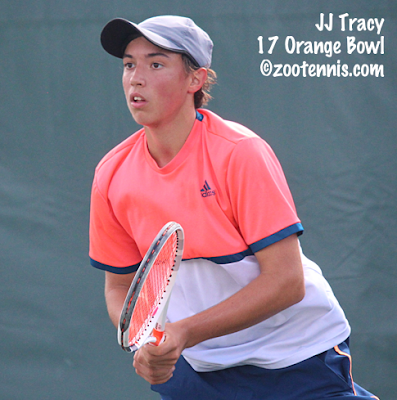 Jones reached the Eddie Herr 12s final earlier this month, falling to Juncheng Shang, who had to withdraw from this Junior Orange Bowl in the fourth round due to an injury. Basavareddy lost to Shang in the Eddie Herr semifinals. The boys 12s, girls 12s and girls 14s finals are scheduled for 9 a.m., with the boys at Salvadore Park and the girls at the University of Miami. The boys 14s final is set to begin not before 11 a.m. The consolation finals, for fifth place, are also on tap Tuesday, with the pairings below. Three of the four top seeds remain in the hunt for Junior Orange Bowl titles, but No. 1 seed Alexandra Yepifanova was eliminated Sunday in the Girls 14s quarterfinals at the Neil Schiff Tennis Center at the University of Miami. The match with Mara Guth of Germany, a No. 9 seed, started well enough for Yepifanova, but Guth turned the match around in the second set and won going away 1-6, 7-5, 6-0. "I made a lot of easy mistakes at the beginning," said Guth, a 14-year-old from the Frankfurt area. "Then I played a bit calmer, and I think that was quite important." Even going up 3-0 with two breaks, Guth didn't feel she had secured the match until she went up 4-0 in the final set. "I think it was important that I made it 4-0," said Guth, who has played the Orange Bowl the past two years, with a third round appearance in the 2015 12s tournament her previous best result. Guth will face unseeded Elvina Kalieva in Monday's semifinals, with Kalieva defeating Elise Wagle, a 17 seed, 6-3, 7-6(5) in an all-US quarterfinal. 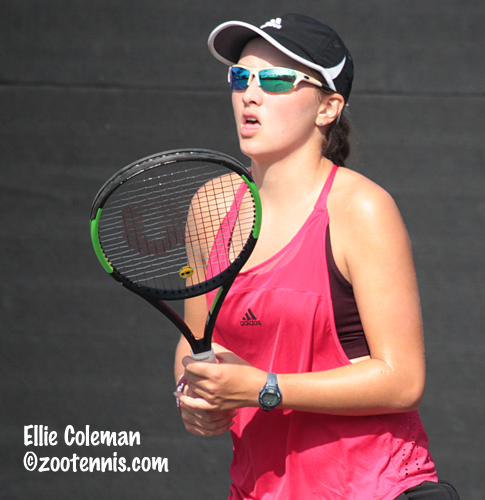 The other all-American quarterfinal was a serious battle, with Ellie Coleman defeating fellow No. 9 seed Kimberly Hance 6-2, 3-6, 6-4. Coleman's semifinal opponent will be 17th seed Dariya Radulova of Bulgaria, who defeated unseeded Calissa Dellabarca 6-2, 6-1. 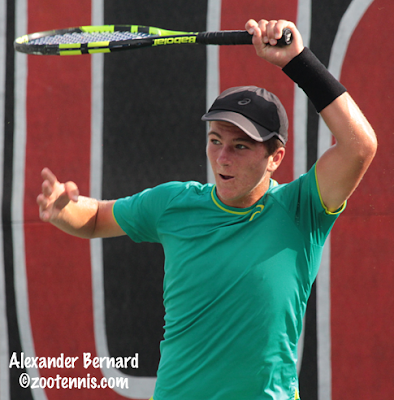 Boys 14s top seed Alexander Bernard moved into the semifinals, beating No. 17 seed Samir Banerjee 6-4, 6-1 in the all-American quarterfinal. Bernard will face No. 7 seed Alvaro Guillen Meza of Ecuador, who defeated Canadian Marko Stakusic of Canada 6-4, 6-1. Unseeded Pedro Boscardin Dias of Brazil took out his fourth seed of the tournament, beating No. 4 seed Francisco Lamas of Venezuela 7-6(3), 6-3. Boscardin will face No. 2 seed Shintaro Mochizuki of Japan, who outlasted Leo Borg of Sweden, a No. 17 seed, 6-2, 5-7, 6-4. Borg, son of Bjorn Borg, fell behind 3-1 in the third set, but went up a break 4-3, only to see Mochizuki storm back to take the last three games. Eddie Herr champion Mochizuki was ripe for the upset, with his double faults and errors appearing to be the result of fatigue, but he continued to return well. Borg made all but one first serve at 4-3, but Mochizuki returned them all deep, negating any advantage for Borg. Mochizuki found the energy to hit a return winner to earn a break point at 30-40 and converted it with a confident overhead. Holding serve was difficult for Mochizuki in the final set, but he held at love for a 5-4 lead and Borg double faulted twice, including on game point, for an anticlimactic end to the match. The 12s divisions have one American in the semifinals. No. 3 seed Nishesh Basavareddy will face top seed Alexander Blockx of Belgium in the boys 12s semifinal, with No. 7 seed Lennon Jones of Japan and unseeded Nahuel Eli of Argentina in the other semifinal. Blockx had the toughest quarterfinal, beating No. 5 seed Cooper Williams 7-6(5), 6-4. Basavareddy won the all-American quarterfinal with Nicholas Mangiapane 6-1, 6-0. Jones dispatched No. 4 seed Rodrigo Pacheco Mendez of Mexico 6-2, 6-0 and Eli defeated unseeded Romeo Hadzimehmedovic of Serbia 6-2, 6-2. Clervie Ngounoue, the No. 8 seed, will take on top seed Linda Fruhvirtova of the Czech Republic after both earned three-set victories in Sunday's quarterfinals. Ngounoue defeated unseeded Myoung Sein of Korea 6-2, 3-6, 6-2, while Fruhvirtova got past No. 5 seed Melisa Ercan of Turkey 6-3 4-6, 6-1. The other semifinal will feature No. 3 seed Alexandra Eala of the Philippines and No. 2 seed Sofia Costoulas of Belgium. Eala defeated No. 9 seed Kayla Cross of Canada 7-6(5), 6-1 and Costoulas eliminated No. 7 seed Priya Nelson 6-2, 6-0. The semifinals and finals of the Girls 12s will be played at the University of Miami. The feed-in consolation tournament for fifth place is now also winding down with the quarterfinals and semifinals scheduled for Monday. For complete draws, see the TennisLink site. The weather has been outstanding for the first four days of the Junior Orange Bowl, yet an increase in humidity caused delays for the round of 16 action played on the three hard court sites. Condensation and little wind pushed back play up to three hours, but when fourth round matches were completed, all four No. 1 seeds were still in the running for winners' trophies. The matches in the boys 12s division were unaffected, because they are played on the Har-Tru courts of Salvadore Park. Top seed Alexander Blockx of Belgium dropped his first set of the tournament to Imran Hazli of Malaysia, but Blockx took control of the third set early in a 6-2, 2-6, 6-2 victory. He will play No. 5 seed Cooper Williams, who also prevailed in three sets, coming back to beat Aaron Sandler 5-7, 6-1, 6-4. Like Williams, the other two Americans reaching the boys 12s quarterfinals are in the top half and will face off tomorrow. No. 3 seed Nishesh Basavareddy, a 6-2, 6-2 winner of Andrew Delgado, will face Nicholas Mangiapane, a No. 9 seed. Mangiapane defeated unseeded Haitam Aboufirassi of Canada 6-4, 6-0. No. 2 seed Juncheng Shang was unable to play his fourth round match today with unseeded Romea Hadzimehmedovic of Serbia after suffering a neck injury while he was warming up an hour or so before the match. At the girls 12s at Biltmore Tennis Center, which had the longest delay for slippery courts, top seed Linda Fruhvirtova of the Czech Republic beat unseeded Victoria Mboko 7-5, 6-0. Several people who saw Fruhvirtova's three-hour win over Mio Mushika of Japan on Friday remarked on the high level sustained throughout that match. In today's match, Fruhvirtova, an Eddie Herr 14s finalist, found her form late in the second set and coasted to victory. Two US girls are through to the quarterfinals. No. 8 seed Clervie Ngounoue, who has not lost more than three games in any set in her four wins, will face unseeded Sein Myoung of Koreas for a place in the semifinals. No. 7 seed Priya Nelson, a 6-4, 2-6, 6-3 winner over Mao Mushika of Japan, will face No. 2 seed Sofia Costoulas of Belgium in the quarterfinals. Costoulas dropped her first set of the tournament to Sayaka Ishii of Japan, but came back for a 6-7(5), 6-1, 6-1 victory. The boys 14s, which will move to the University of Miami on Sunday, also has just two Americans remaining and they will meet in the quarterfinals. Top seed Alexander Bernard, who beat Andrew Chang, a No. 17 seed, 2-6, 6-4, 6-2, will face No. 17 seed Samir Banerjee, a 6-1, 6-3 winner over No. 9 seed Tim Gauntlett of Hong Kong. No. 2 seed Shintaro Mochizuki continued his romp through the draw, beating unseeded Benjamin Kittay 6-1, 6-2, and he will play Bjorn Borg's son Leo, a 17 seed, who beat No. 5 seed Jacobi Bain of the Bahamas 6-3, 6-3. No. 3 seed Christopher Li of Peru was defeated by Marko Stakusic of Canada, a No. 17 seed 6-1, 6-1. 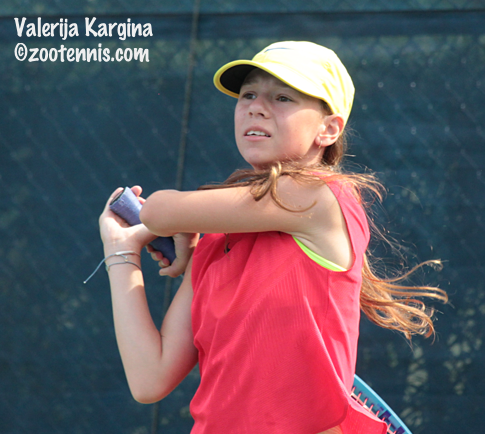 In the girls 14s, six Americans have reached the quarterfinals, including top seed Alexandra Yepifanova, who beat No. 17 seed Zongyu Li of China 6-2, 6-1. Unseeded Elvina Kalieva will face No. 17 seed Elise Wagle and No. 9 seeds Kimberly Hance and Ellie Coleman will face off in the other all-American quarterfinal. The sixth is unseeded Calissa Dellabarca, who beat No. 2 seed Noa Krznaric of Croatia 6-3, 6-1. For complete results from today's action and times for Sunday's quarterfinals, see the TennisLink site. 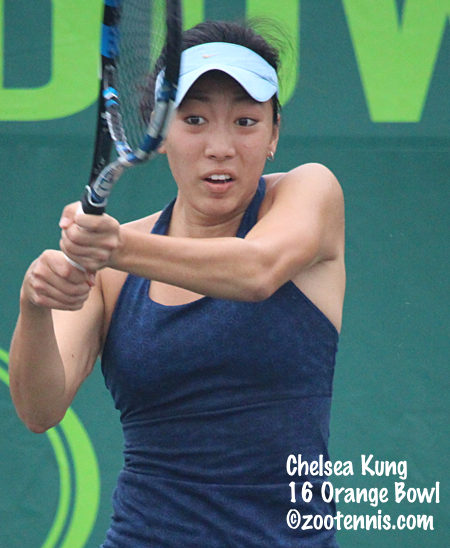 Before I get to the results from Day Three of the Junior Orange Bowl, it's time for my recap of last week's Orange Bowl for the Tennis Recruiting Network. ITF World Junior champion Whitney Osuigwe finished her impressive year with a second Grade A title, while Hugo Gaston of France claimed his first title at the highest level in junior competition. I will post the photos and videos from the Orange Bowl when I return to Kalamazoo. One of the problems with covering the Junior Orange Bowl, which I don't have at the Eddie Herr or the Orange Bowl, is trying to follow action at four separate sites. Today I went to Crandon Park for my first look at the Boys 14s, and while I saw some close matches, only one top 8 seed was eliminated, with Saud Alhogbani of Saudi Arabia, the 2017 USTA 14s Clay and Hard Court champion, falling to No. 17 seed Samir Banerjee 6-3, 6-4. Evan Wen, a 17 seed, gave No. 4 seed Francisco Lamas of Venezuela a battle, but Lamas was too solid in the final set of his 6-2, 4-6, 6-1 victory. Unseeded Victor Lilov, the Junior Orange Bowl 12s champion, led 5-2 in the second set tiebreaker, but No. 5 seed Jacobi Bain of the Bahamas won the final five points of the match for a 6-3, 7-6(5) victory. Two unseeded Americans advanced to the round of the 16, with qualifier Gabrielius Guzauskas beating Adrian Dibildox of Mexico 6-0, 6-1 and Benjamin Kittay overcoming Louis Cloud 6-3, 7-5. I got my first look at Leo Borg, son of the legendary Bjorn Borg, and while the family resemblance is easy to spot, the game style is quite different, at least in the several games I saw in the 17th seed's 7-5, 6-4 win over Jack Anthrop, a No. 9 seed. Borg was not content to rally from the baseline, but moved forward regularly to finish points at the net. I've also heard he is not as emotionally controlled as his father was on court, but I didn't see any evidence of volatility in the tense last few games of the first set. Top seed Alexander Bernard earned his spot in the round of a 16 with a 7-6(2), 6-3 win over unseeded Alex Lee, and No. 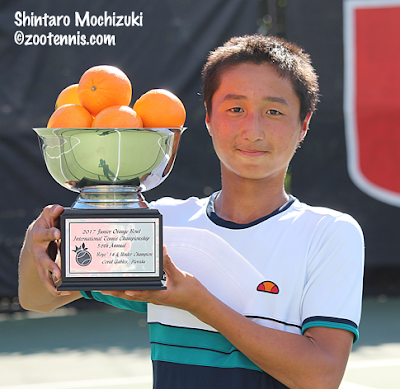 2 seed and Eddie Herr champion Shintaro Mochizuki of Japan displayed his usual form, defeating unseeded Michael Zheng 6-1, 6-2. The place to be for the first upsets of the tournament was the University of Miami, where Girls 14s No. 3 seed Charlotte Owensby, No. 4 seed and Eddie Herr champion Vivian Ovrootsky and No. 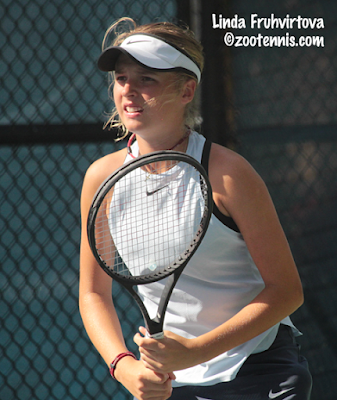 7 seed Kailey Evans, the 16s Eddie Herr finalist, were eliminated. Owensby lost to Elvina Kalieva 7-6(4), 6-4, with Kalieva not seeded this week, presumably because she has been playing 18s tournaments since last February. Ovrootsky was beaten by Klara Milicevic of Sweden, a No. 17 seed, 3-6, 6-4, 6-3 and Evans fell to No. 17 seed Madison Sieg 6-4, 6-1. The 12s lost only one top 8 seed today, although the girls No. 1 and No. 2 seeds had to grind out tough wins to advance. No. 1 Linda Fruhvirtova managed to defeat Mio Mushika of Japan 7-6(4), 6-7(6), 7-5, which from the score alone looked to be an epic. I was able to get back from Key Biscayne to watch the final set of No. 2 seed Sofia Costoulas's 6-3, 7-6(9) win over unseeded Katherine Hui, and Costoulas was fortunate to avoid a third set, with Hui serving for the set at 5-4 and then having two set points at 6-5 and 7-6 in the tiebreaker. In the boys 12s, none of the 16 third round matches went to a third set, with the closest contest unseeded Argentine Giuliano Furlotti's 6-4, 6-4 win over No. 9 seed Andre Megrabian of Belgium. Top seed Alexander Blockx of Belgium beat Luca Lemaitre Vilchis of Mexico 6-1, 6-4 and No. 2 seed Juncheng Shang, the Eddie Herr champion, downed Reiya Hattori of Japan 6-1, 6-3. See the TennisLink site for all results from Friday and for Saturday's fourth round times. Day Two of the 2017 Junior Orange Bowl featured another sunny day without notable upsets at the four Miami-area sites. As was the case on Wednesday, the top seeds breezed into the third round, with the one exception being 14s No. 1 seed Alexander Bernard who dropped the first set before closing with more typical top seed scores. Bernard beat Lucas Britez of Paraguay 4-6, 6-0, 6-1 at the Crandon Park site, where I'll be spending Friday. Today I spent the majority of the day at the Girls 14s at the Neil Schiff Tennis Center at the University of Miami. I watched top seed Alexandra Yepifanova and No. 3 seed Charlotte Owensby dominate their opponents on court 1, with Yepifanova defeating Mariana Manyoma of Colombia 6-0, 6-1 and Owensby downing Ashlyn Krueger 6-1, 6-1. Closes matches were rare, but I did see one that was a battle. Hina Inoue, who somehow was not seeded despite reaching the semifinals of the Eddie Herr and having the highest ITF ranking (226) in the draw, and No. 9 seed Elaine Chervinsky went at it for over two and a half hours, with Inoue claiming a 2-6, 6-4, 6-4 victory. Later in the day, No. 2 seed Noa Krznaric of Croatia, who is playing in her fifth Junior Orange Bowl, beat qualifier Jacqueline Soloveychik 6-2, 6-1. Krznaric reached the 12s final in 2015. The Eddie Herr champions have fared well in their opening matches this week, with G14s winner Vivian Ovrootsky, the No. 4 seed, beating Danielle Tuhten of Canada 6-2, 6-3. Boys 12s winner Juncheng "Jerry" Shang, seeded second, lost his first game of the tournament while beating qualifier Matteo Antonescu 6-1, 6-0. Boys 14s winner Shintaro Mochizuki of Japan, the No. 2 seed, blanked Youssef Hazem of Egypt. Girls 12s champion Brenda Fruhvirtova of the Czech Republic, who is 10, is not playing this week due to the implementation of a new rule that requires a competitor to be 11 years old, but her 12-year-old sister Linda, who was the runnerup in the 14s, is the top seed in the 12s. She defeated Gala Arangio of Mexico 6-3, 6-4 in today's second round. Alexander Blockx, the top seed in the boys 12s, received a walkover into the third round, with Andrew Rundle unable to compete due to illness. Below are the top 8 seeds remaining in contention, and as you can see, only one of them has lost in competition in the first two rounds. For complete draws and times for Friday's matches, see the TennisLink site.